Quite by accident, I have accumulated a nice selection of Sheaffer pens ranging from about 1920 to 1960. Mostly they are from the long-lived and market-changing Balance line, but they include later snorkel, touchdown, and Imperial pens as well. Here are two pen and pencil sets that represent two of Sheaffer's most ingenious designs: the snorkel with its world's most complex filling system, and the Imperial with its striking inlaid nib. Both sets are gold-filled. Two Imperials from the early 1960s. The Imperial line included a number of different models and styles. The top pen below is the Imperial Compact Cartridge pen, which to me is a continuation of the pocket pen concept that appeared from time to time in the Sheaffer lineup. The lower pen is a basic all plastic Imperial IV with the touchdown filling system. 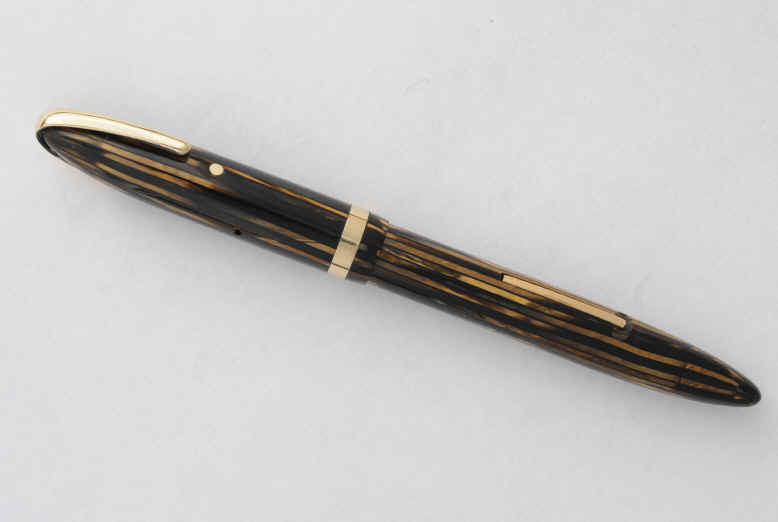 This pen is the base model of the Imperial IV line while the gold-filled pen in the picture above is very nearly the top of the same line. Both have the same nib and filling system. Below are three versions of the Balance line from the 1930s, from the smallest to the largest. From front to back: the Petite Balance (1932), a standard Balance (1936), and an Oversize Balance (1936). 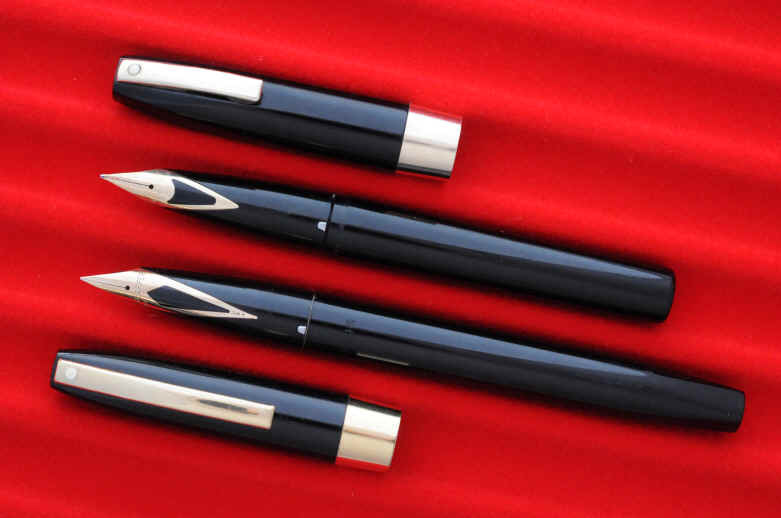 Sheaffer offered most Balance models in both lever and vac-fil versions. The Standard Balance below is vac-fil, while the Petite and Oversize happen to be lever fill. My oldest Sheaffer is a Black Chased Hard Rubber Self Filling No. 2 Ringtop. This was a lady's pen or perhaps a man's vest pocket pen, worn on a ribbon or a chain. This pen was originally jet black, but has oxidized over time and is now a dark brown hue except for the section and thread area on the barrel, which has been protected by the cap. Military regulations during WW II required that a pen in a shirt pocket not cause the pocket flap to bulge nor should the clip show below the pocket flap. 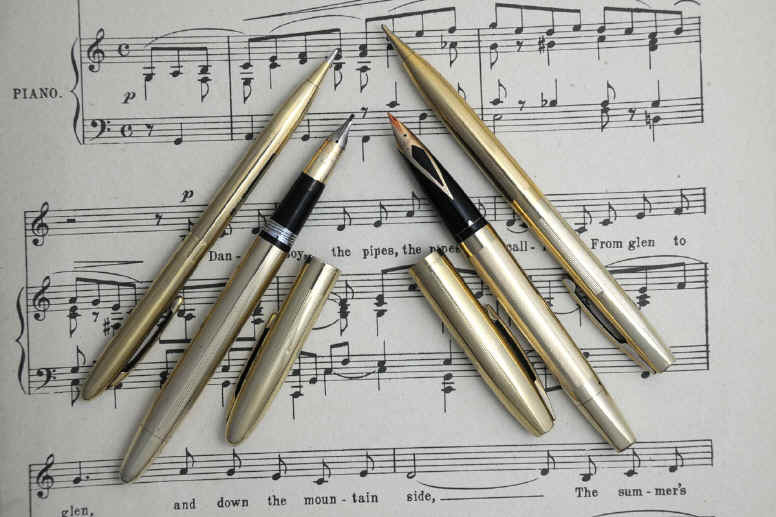 Sheaffer's standard clip, such as those on the Balance pens above, did not meet the regulation. 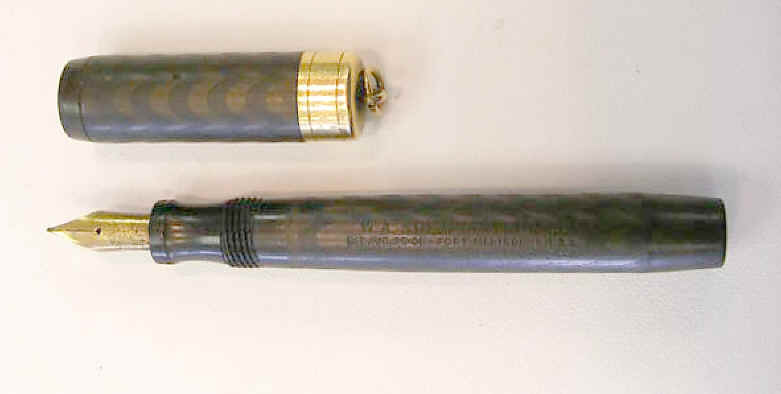 They cleverly developed the military clip to meet the regulations and produced Balance pens with this style clip for several years during the war. This over-the-top clip allowed the pen to drop completely into the pocket. Here is a Lifetime Vigilant in brown striated plastic with a military clip.